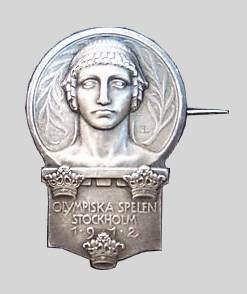 On the 14 November, 1910, the Swedish Olympic Committee accepted for the badge to be given to the officials and competitors present at the Games, a design by Erik Lindberg, representing the head of Pallas Athene, as the principal figure, resting on a four-sided plinth adorned with the Three Crowns of Sweden. The plinth bore the following inscription in Swedish: “The Olympic Games of Stockholm, 1912”. About 5,000 examples of the badge were struck in oxidized silver-plated metal, in addition to which, some 50 were struck, made of silver-gilt, the last-mentioned being for the members of the Swedish and the International Olympic Committees. As the badge for the officials and the competitors was to entitle the wearer to admission to all the places where competitions were to be held, and as places had been reserved in various sections of the Stadium for the different groups of functionaries, the Swedish Olympic Committee determined on the following system of mounting and distributing the badge in question: The badge, in silver-gilt and attached to a blue and yellow ribbon, was to be worn by the members of the Swedish Olympic Committee, and was to entitle the wearers to admission to the box in the Stadium north of, and next to the Royal box; to a reserved seat at all the other places where the Olympic competitions were being held; to the seats on the northern slope of the Stadium and to all the evening entertainments at the Stadium during the period July 6—July 15. The same badge, unmounted, was distributed to the members of the International Olympic Committee, and conferred the same privileges as were attached to that worn by the Swedish Olympic Committee. The same badge unmounted and in silver-gilt, was presented to the ladies of the members of the Swedish and the International Olympic Committees, and entitled the bearers to the same privileges as those possessed by the said members. The presidents of the special committees, and the leaders of the teams of the various nations, were presented with the badge mounted on a blueand- yellow cockade. This badge, together with a blue identificationcard, entitled the wearer to admission to the Committee-box at the Stadium; to a reserved seat at all the other places where Olympic Competitions were being carried on, and to the northern slope of the Stadium. The competitor’s badge, attached to a small yellow cockade, and accompanied by a yellow identification-card, admitted the higher officials and the assistant leaders of the various nations to the Committeebox at the Stadium, and to the northern slope of the Stadium. The other functionaries of the various nations received a competitor’s badge mounted on a blue-and-yellow bow and riband, this entitling them to admission to the northern slope of the Stadium, but not to the competing places other than the Stadium, unless the wearer also possessed an official’s card for the branch of athletics that might be going on at any of the said places. Those persons acting as “hosts” of the various nations, were given the competitor’s badge attached to a bow in the colours of the respective nations. Together with a blue identification-card, these badges admitted the bearer to all the competitions. The competitor’s badge, which was presented to all the active competitors, gave admission to the northern slope of the Stadium, but not to any other competing ground, unless the bearer of the badge also possessed a competitor’s card for one or other of the competitions carried on at these places. The journalists present officially at the Games were presented with a special badge in the form of a metal button, with the inscription “Stadion. Pressen”, in gold letters on a blue enamel ground. This badge entitled the wearer to free admission to the Press-box at the Stadium and, if he also possessed a special correspondent’s-card, to the other competing grounds.